Before we begin, we would like to tell you a story! Sam is working in a huge IT Company, and he is going to attend an important meeting in a distant place. However, as he was in hurry to get there, he forgot to take pen drive, in which he had stored the presentation file for meeting. He had taken laptop with him, neither. Nevertheless, to everyone’s surprise, Sam did the presentation very well! Do you know how he did it? As he was familiar his usual forgetfulness, he had stored those presentation files in pCloud, one of the best platforms to store all your files and access from any devices and platforms around the globe. So, Sam downloaded that presentation file using another laptop he got, and used it for presentation. In this article, we have come up with the review of pCloud, exploring different sections of its wonderful services and features. We are sure that, in the long run, you willlove pCloud! First of all, for those, who have not heard about pCloud, we will give an introduction to this cloud file storage service that lets you have all your file EVERYWHERE. Simply put, pCloud is a web folder, in which you can store all your files, including docs, music, video, etc, in easy way! Once you have uploaded those files to pCloud account you would be able to access those files from different devices, running on different platforms, including Windows, Android and iOS. pCloud is a free service, which offers premium plans as well. When compared with other cloud file storage services, available for public, pCloud is a nice choice you can make. Now, we will go deep into pCloud storage service. As the first part of this, we will check out, what pCloud is offering. Presence of different plans and pricing is what makes pCloud top for personal, professional and business purposes. Free and paid plans offered by pCloud are follows. Free Plan – Free plan of pCloud is something impressive for those who want to get cloud storage service for personal use. In this plan, you will have a storage space of 10GB. Since pCloud does not have speed limits or file size limits, you’ll have an option to utilize maximum upload/download speed offered by your ISP. Plus, you can get 24/7 support using various methods and file history for 30 days. Obviously, 10GB of storage seems quite impressive for personal use. Moreover, the important feature of this free plan is that you can upgrade free storage up to 20GB through some easy steps, like inviting your friends (when you invite your friends and they join pCloud, they too will receive 11GB file storage space instead of 10), checking out pCloud guides, promoting pCloud in social media etc. Even after getting that 20GB free upgrade, you can upgrade storage space using premium plans as given below. 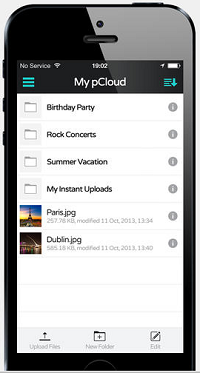 Premium Ones – The first premium plan of pCloud costs $4.99 per month and upgrades storage space to 100GB. However, if one buys this plan for one year, he/she can get 20% discount and will have to pay only $49.99 per year, which will otherwise be around $60. Unlike free plan, file history duration of this plan is 180 days. Altogether, this premium plan seems to be sufficient for movie freaks and others who find 20GB insufficient for personal use. Also, you can opt this if you are looking for small business. Next two plans respectively provide 300GB and 1TB storage space and are suitable for business and enterprise kinds of purposes. Like the previous premium plan, it consists of priority email support and file history for 180 days. While the first plan, providing 300GB, costs $14.99 per month (and $149.99 per year), second one that provides 1TB space will charge you $49.99 per month (and $499.99 per year). As you can see, 20% discount is applicable for both these. We already mentioned that you could access pCloud from ANY device with internet connection. What makes pCloud to hold that adjective is its web-based User Interface that supports almost any web-browser. Indeed, it is effective. When it comes to dedicated applications, pCloud satisfies almost every popular platform. The tool available for PC is called pCloud Sync, and it is available for Windows, Macintosh and Linux, and thereby covering everything. It should be noted that pCloud Sync is not about creating an exact copy of pCloud folder in your PC. On the other hand, using pCloud Sync, you will be able to synchronize multiple folders in your PC with pCloud account. Along with pCloud Sync, dedicated applications for Android and iOS are also available from pCloud. Using these apps, you can integrate a smaller yet effective version of pCloud in your Smartphone or Tablet PC. We will have a detailed look on these three tools – pCloud Sync, pCloud for Android and pCloud for pCloud for iOS – later in this review. When it comes to cloud-based file storage, file sharing is inevitable, especially when you use the service for business-based purposes. For instance, you will have to let your colleagues through the presentation or decision you’ve made before finalizing it. To your respite, pCloud offers different methods to share files and folders from pCloud account. There are two options available for sharing folders with others, who may or may not have a pCloud account! In order to do this, you have to provide their email ID. If they already have a pCloud account, they will receive access to your folder and they can see your folder in ‘Shared with Me’ section of their account. Nonetheless, if they don’t have one account, they will get an invitation link, following which they can create a pCloud account. While using this method to share folders, you can set certain permissions such as read, create, modify and [or] delete. However, the method is available for sharing folders only. Download link is a special feature of pCloud, using which you can let others download particular files or multiple files from a folder. To create a download link, you have to click on ‘share’ option available with each file and folder. Then, you can share that download link anyone, with whom you like to share your file or files.With each download link, it’s possible to check how many have downloaded your files. This feature is very useful when you want to share a file or folder with whole public and not specific people. Yet, we agree that download links are less secure than the former method, particularly when using short links. File management aspect of pCloud is something great in its web-based user interface. You can use that interface as if you are using a PC-based file explorer. You have options to copy, move and delete files from one location to another. Also, you can download multiple files from one folder in a single archive file. There are also three options for uploading files to pCloud. 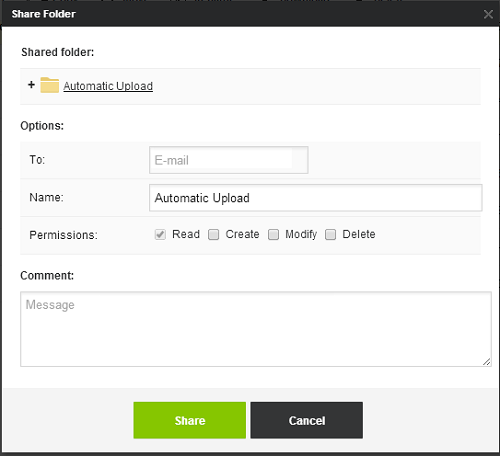 In the first one, you can choose a particular file and upload it to your pCloud folder. In the second, you can upload a complete folder to pCloud, which is useful when one folder has large number of files in it. In the third, different one, which is called Remote Download, you have to provide URL of file and pCloud will download it for you with maximum speed. 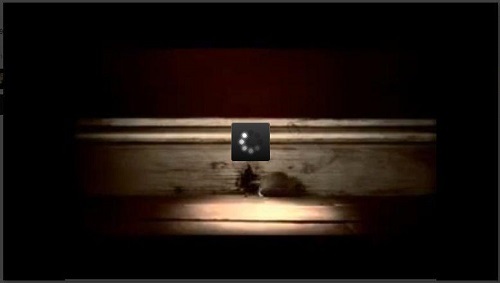 What do you think about playing audio files and videos within your web browser itself? If you like it, you will like the integrated video & audio player of pCloud as well. And, we think the audio player will be much useful than latter. 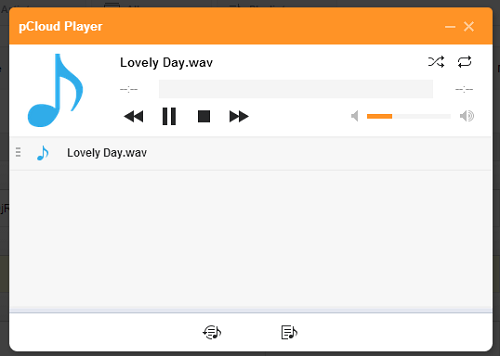 This audio player is powerful and feature-rich enough to compete with dedicated audio players. You can play all your music files you have stored, create certain playlists and apply effects such as shuffle, repeat etc. Altogether, this will meet up with your requirement. Similarly, if you have stored videos or movies in pCloud folder, you can play them using this player, and it is capable of playing HD videos. Indeed, both of them are great additions to file management section of pCloud. 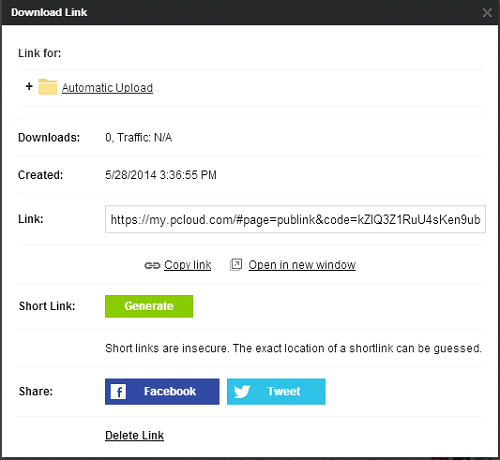 Upload Link is an innovative feature put forward by pCloud! It is the brand new way to receive files from others than uploading by yourself. 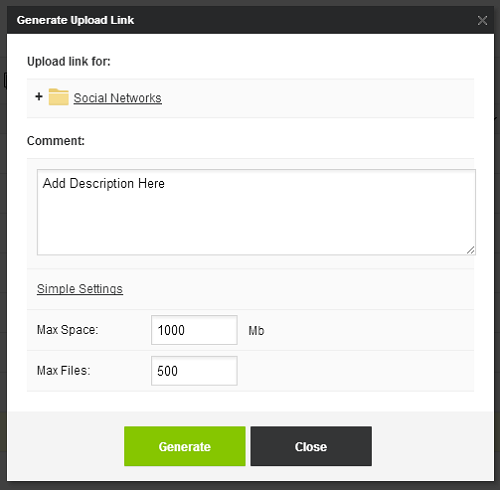 In this way, you can create a unique upload link for a specific folder and share it with those, from whom you want to receive files. So, those people can access that link and upload files to your pCloud account. Also, you can get an email account when creating an upload link. And, those people can send files to that email ID as attachments, and those files will be saved in your pCloud folder. Indeed, this feature is something impressive, especially when you want to collect files from others, for instance, bio data from employees in your company. You can take the official word from pCloud for security of files you have stored in your pCloud folder. As you can see, pCloud utilizes TSL/SSL encryption protocols to ensure security. As we said, pCloud offers a dedicated application for Android Smartphones and Tablet PCs. It offers almost all kinds of features offered by pCloud. 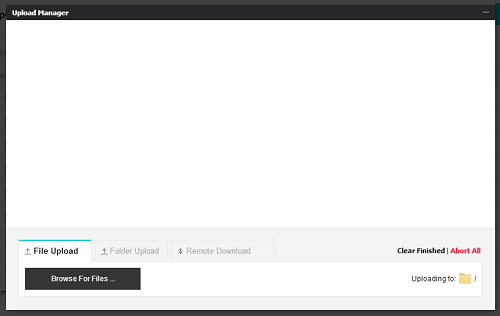 For instance, you can share all your files using download links whereas. Yet another noticeable feature of pCloud for Android is the in-built audio player, which can act as an alternative for your default music player, particularly while considering support for playlists. There are also some other features. You have an option to ‘Favourite’ certain files to make them available offline. By favouriting, pCloud will download that files to your device. Also, auto upload feature of this application lets you set a trigger to upload all photos and videos as you have captured them. Of course, pCloud for Android does very well in shrinking your pCloud folders in such a way that they would fit your Smartphone screen. Moreover, user interface of pCloud for Android is of course superb and intuitive. Using this official application, you can turn your iPhone, iPad or iPod touch to a device to access pCloud folders in a few taps. Just like we had mentioned in the case of pCloud for Android, it too has some features such as Favouriting, Auto Upload etc to make your experience automated. Sharing options are also present in the official application of pCloud in such a way that you will find it intuitive. Also, you can find an integrated audio player, using which you can play your favourite tracks or playlists you have created. Indeed, this application from pCloud will give an awesome mobile experience for you. We have already mentioned that pCloud Sync is available for different platforms such as Microsoft Windows, Mac & Linux. According to our experience, pCloud Sync is one of the effective tools to synchronize your PC folder and cloud based folders. To use this you have to follow only simple steps: Install this tool, provide username and password and select folders that you want to be synced. You can either enable two way syncing or one-way syncing according to your convenience. pCloud Sync will be very useful when you are using pCloud for business + personal purposes. For instance, when you are working both at home and office, you can keep those work documents up-to-date by enabling synchronization. UI of this synchronization tool is also impressive. Here, we have reviewed pCloud Sync for Windows PC, though it is available for multiple platforms. You can use pCloud Sync to synchronize your files with pCloud from Linux and Mac as well. What you have to do is to download the appropriate version from official page of pCloud sync. For those who keep important photographs, videos and files in social media and cloud storage services, this feature of pCloud is something great. Using social backup feature of pCloud, you can backup different kinds of media files from social networks and image sharing sites such as Facebook and Instagram. 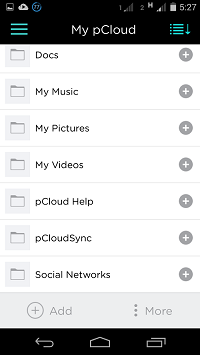 Also, pCloud now supports Dropbox, which means you can backup files you have stored in dropbox using pCloud. So, this feature will be helpful to all those social media freaks. Among mentioned features, some features were powerful to grab attention of ours. For instance, we loved the no-limit behaviour of pCloud service that enables users to have maximum speed offered by ISP while uploading files to pCloud or downloading from pCloud. Likewise, the remote download feature of pCloud makes enough sense, as it will be much useful when you want to get files from somewhere else than PC. Now, when it comes to verdict, pCloud proves itself! What we loved most in pCloud is its simple user interface that we can see in both web-based UI and dedicated applications. Also, a normal user can avail free storage space up to 20GB, which is something great. So, we would like to recommend pCloud to everyone who is looking for a way to manage files from anywhere around the globe!